Muscles: Muscles are the fibrous tissues capable ofcontracting to cause body movement. Abduction: Moving the fingers away from the middlefinger. Flexion: Moving the last two segments of thefinger towards the base of the fingers. Extension: Moving the last two segments of thefinger away from the base of the fingers. Flexion: Moving the palm of the hand towards thefront of the forearm. Extension: Moving the back of the hand towards theback of the forearm. 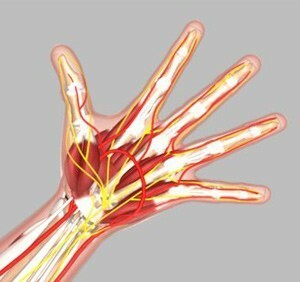 Adduction: Moving the pinky side of the handtoward the outer aspect of the forearm. Abduction: Moving the thumb side of the handtoward the inner aspect of the forearm.